The first location for checking security issues on your laptop is the Action Center. To view the Action Center in Windows 10, click the Notifications icon on the taskbar. The Action Center lists items requiring attention, such as updating software or checking the status of a failed backup. At the bottom of the Action Center lie the Quick Settings buttons. Click a notification in the Action Center list to carry out whatever task is necessary to deal with the issue. Display the Control Panel window. Press Win+X to show the supersecret menu, and choose the Control Panel item. Below the System and Security heading, click the link Review Your Computer’s Status. 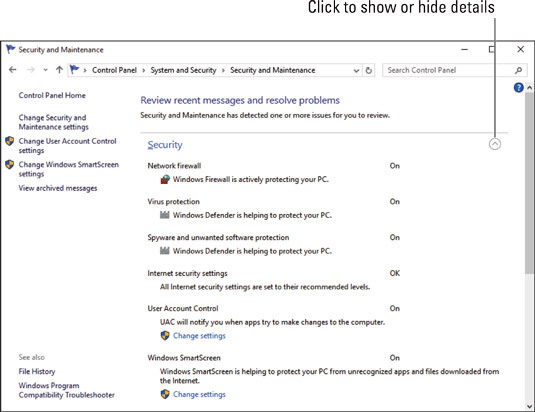 The Security and Maintenance screen appears. In older versions of Windows, this screen was known as the Action Center. The Security and Maintenance screen displays the status of necessary security measures, including Windows Firewall, Windows Defender, and other protective measures. It may also display warnings prompting you to activate or complete actions that help make your laptop more secure. Follow the directions in the window to carry out those tasks.